Background: Axillary brachial plexus block (ABPB) is safest among other methods of brachial plexus block because of its ease and reliability. The two approaches of ultrasonography-guided ABPB are perivascular (PV) and perineural (PN). Aims: This study was conducted to compare primary outcomes such as performance time, onset of the block, number of needle passes, block success rate, duration of sensory and motor block, and complications between ultrasound-guided PV and PN ABPB in patients posted for upper limb surgeries. Settings and Design: This prospective randomized study was conducted on 106 patients American Society of Anesthesiologists Class I and II posted for forearm, wrist, and hand surgeries, who were allotted into Group PV and Group PN 53 each. Materials and Methods: In both methods, 20 mL of the drug was used. To start with, musculocutaneous nerve was blocked with 5 mL of the drug. In the PV technique, remaining 15 mL of the drug was deposited anterior and posterior to axillary artery, and in PN technique, 5 mL of the drug was injected around radial, ulnar, and median nerve. Statistical Analysis: Mann–Whitney and Chi-square test were used for statistical analysis. Results: Significant difference was observed between the two groups in performance time (PV – 8.647 ± 0.54 min and PN – 14.53 ± 0.20 min), onset time (PV – 19.48 ± 2.83 min and PN – 13.86 ± 1.81 min), and number of needle passes (PV – 2.30 ± 0.50 and PN – 4.91 ± 0.66). Other parameters were comparable in both the groups. Conclusions: Ultrasound-guided PV axillary plexus block is better than PN axillary plexus block with respect to performance time and number of needle passes; but onset time was shorter in PN block, with precaution eliminating the risk of complications. The use of ultrasound in the field of anesthesia has added newer dimensions to our whole anesthetic management and patient care. Ultrasound-guided nerve blocks increase the block success rate as structures are directly visualized compared to nerve block with peripheral nerve locator and blind technique. The axillary approach of brachial plexus is the most commonly performed technique because of its ease, feasibility, and acceptability. This technique is used for surgery of forearm, wrist, and hand. The axillary brachial plexus block (ABPB) performance with ultrasound improved the success rate and reduced complications. The success and quality of the nerve block depend on the right placement of the local anesthetics near the defined nerve. At present, perineural (PN) technique and perivascular (PV) technique are described for the performance of ABPB. In the past in 1981, Abramowitz and Cohen described Doppler ultrasound use in identifying the axillary artery in difficult axillary plexus block. Ustuner et al. explained that ultrasound is more suitable in identifying vascular and neural positional variations compared to a traditional landmark-guided approach. Ultrasound-guided axillary block studies by Chan et al., Williams et al., and Sites et al. showed a reduction in block performance time and improvement in the success rate. Furthermore, Marhofer et al. and Harper et al. reported that a reduction in the amount of drug was required in the procedure. Tran et al. compared PV injection and PN multiple injection techniques using nerve stimulator and proved that there was no difference in the success rate. However, some studies reported that there is a low sensitivity of nerve to the needle contact. This technique requires a frequent change in needle positioning which leads to an increased risk of vascular puncture. Recently, Imasogie et al. and Bernucci et al. compared ultrasound-guided PN injection and PV injection reporting that there was no difference in the success rate. The PN technique of ABPB involves identification of nerves using ultrasound and injecting local anesthetics in the perineurium of the radial, ulnar, median, and musculocutaneous nerve. On the other hand, the PV technique of ABPB involves localization of axillary artery using ultrasound followed by injection of local anesthetics around the axillary artery, which covers median, ulnar, and radial nerve.,, Separate injection for the musculocutaneous nerve is required since it is not near to the artery. The widely used method of ABPB is the PN technique but it has certain limitations, such as the risk of direct nerve injury due to the lack of operator skill and anatomical variation. Several studies,,, conducted on PV technique concluded that one or two injections around the axillary artery provided a complete successful block. The onset of the block is faster, with fewer injections and less discomfort and less pain associated with the procedure. The concern about efficacy and the safety of the PV and PN techniques still remains questioned. The present study was conducted with a view to selecting the technique which performs well in terms of performance time of the block, success rate of the block, and complications during the block in upper limb surgeries. A total of 106 patients undergoing forearm, wrist, or hand surgery were randomly selected and divided by computer into two groups. There were 53 patients in each group. Group I was PV, and Group II was PN. Patients in the age group of 18–60 years and belonged to the American Society of Anesthesiologists (ASA) Physical Status Class I and II were included in the study. Patients with an earlier surgery in the axilla, infection in the axilla, allergy to local anesthetic agents, coagulopathy, preexisting neuropathy were not included in the study. We have done a preanesthetic evaluation after taking the Institutional Ethical Committee clearance. We explained the procedure to the patients and informed written consent was obtained from them. Patients were kept nil by mouth for 6 h before surgery. All the patients were advised tablet Anxit (0.5 mg) orally at night before surgery to relieve the anxiety. On the day of surgery, in the operation theater, all the patients were connected to the pulse oximeter, noninvasive blood pressure cuff, and electrocardiography leads. Baseline values were recorded. An intravenous line secured with a 20-gauge cannulae. Premedication with intravenous ondansetron (0.15 mg/kg), glycopyrrolate (0.01 mg/kg), and midazolam (0.1 mg/kg) was given. Patients were positioned in supine with the arm abducted to 90° and elbow flexed to 90°, with dorsum of the hand resting on the bed or pillow. We performed the block procedure ensuring in-line alignment of patient, operator, and ultrasound machine. Then, the ultrasound probe (SonoSite M-Turbo machine) was placed in the axilla, in between the biceps brachii and pectoralis major muscle. The pulsating axillary artery was visualized, and the probe was moved to find the individual nerves around the artery. In both groups, 20 mL local anesthetic was administered. This includes 8 mL of 0.5% bupivacaine hydrochloride, 10 mL 2% lignocaine hydrochloride, and 2 mL of dexamethasone (4 mg/mL), and spread of the drug was observed. The parameters such as imaging time, needling time, performance time, onset of a block, block success rate, number of needle passes, duration of the sensory block, duration of the motor block, block related pain, vascular puncture, and local anesthetic toxicity were also noted. In Group I (PV), the imaging time is defined as the time required for visualizing the musculocutaneous nerve and the axillary artery. In the Group II (PN), the imaging time is defined as the time needed to localize all nerves. After obtaining a satisfactory image, using an in-plane technique, the 22-gauge needle was advanced toward the musculocutaneous nerve and 5 mL of local anesthetic drug mixture deposited around the nerve in both groups. In Group I (PV), remaining 15 mL of local anesthetic was injected anterior and posterior to the axillary artery. In Group II (PN), the radial nerve was anesthetized after the musculocutaneous nerve and then the needle is withdrawn toward the skin and redirected toward median and ulnar nerves and then anesthetized with 5 mL of local anesthetic drug. During the block performance, the needling time is defined as time interval between introduction of needle and the end of local anesthetic injection through the needle. Performance time is defined as the sum of the imaging time and needling time. The onset of the block is defined as the time from removal of the needle to the onset of surgical anesthesia. After local anesthetic injection, assessment of sensory blockade and motor blockade is carried out every 5 min up to the 30 min of onset of the block. Sensory blockade of the musculocutaneous, median, radial, and ulnar nerve was assessed in the corresponding dermatome areas and graded according to a 3-point scale using pinprick test: 0 = sharp pin sensation felt; 1 = analgesia (dull sensation felt); or 2 = anesthesia (no sensation felt). The onset of sensory blockade is considered when there was a dull sensation to pinprick along the distribution nerves. The duration of the sensory block is defined as the time interval between the end of local anesthetic administration and the complete resolution of anesthesia in dermatome areas. In upper extremities, modified Bromage scale was followed for the assessment of motor block: Grade 0 = normal motor function with full extension of the elbow, wrist, and fingers; Grade 1 = decrease motor strength with the ability to move fingers and/or wrist only; and Grade 2 = complete motor blockade with the inability to move fingers. The onset of motor block is considered when there was Grade 1 motor block in upper limb after the block procedure. Peak motor block considered when there was Grade 2 motor block in the upper extremities. Duration of the motor block is defined as the time interval between the end of local anesthetic administration and the recovery of complete motor function of the hand and forearm after the block. Block is considered as a failure when the analgesia is absent to pinprick at the site of the surgical incision after 30 min of drug administration. After the block, the onset and duration of sensory block, onset and duration of the motor block, number of failed blocks, and complications in terms of block-related pain, paresthesia, and vascular puncture were noted. When pain during surgery, the block is considered as a failure and supplemented with opioids, general anesthesia, rescue blocks, or local infiltration at the surgical site. The level of procedural pain immediately after block placement is recorded by a 10-cm visual analog scale (VAS; 0 = no pain, VAS 10 = severe pain). With reference to Bernucci et al., the mean ± standard deviation (SD) of the performance time in two groups was 8.2 ± 2.3 min for PV group and 15.7 ± 3.2 min for PN group, hence 95% confidence level and 80% power with anticipated mean ± SD 7.5 ± 0.9 was considered for the study. Based on this, the sample size calculated in each study group was 53. In the study, the categorical data were expressed in terms of rates and percentage, and continuous data were expressed in terms of mean ± SD. Data analysis was carried out using SPSS 17.0 Software (IBM Corp, Armonk, NY, USA). Mann–Whitney U-test was used to compare quantitative variables of the two groups. The categorical data were compared using the Chi-square test. The probability value P < 0.05 was considered statistically significant. Demographic variables such as age, body weight, gender distribution, and ASA grade were comparable between the groups. They were not statistically significant [Table 1]. We found that in Group I (PV), the mean imaging time was 106.34 ± 19.08 s, the mean needling time was 412.36 ± 28.19 s, and hence the mean performance time was 8.64 ± 0.54 min, whereas in Group II (PN), it was 132.83 ± 6.17 s, 739.09 ± 11.31 s, and 14.53 ± 0.20 min, respectively, which was statistically highly significant (P < 0.0001) [Table 2] and [Graph 1], [Graph 2], [Graph 3]. In Group I (PV), the onset time was 19.48 ± 2.82 min, but in Group II (PN), it was 13.86 ± 1.81 min, which was statistically highly significant (P < 0.0001). 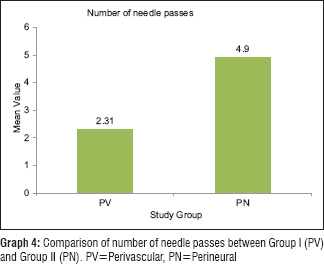 The mean number of needle passes in Group I (PV) was 2.31 ± 0.50 but in Group II (PN) was 4.90 ± 0.66, which was statistically highly significant (P < 0.0001) [Table 2] and [Graph 4]. The success rates of Group I (PV) was 92.5% and Group II (PN) was 94.3%. The success rates were comparable, and the difference was not statistically significant (P > 0.05). In Group I (PV), the duration of sensory block was 736.0 ± 12.45 min, whereas in Group II (PN), it was 730.73 ± 17.73 min, which was not statistically significant (P > 0.05). 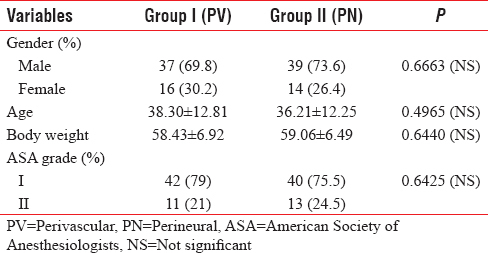 In Group I (PV), the duration of motor block was 638.6 ± 11.56 min, whereas in Group II (PN), it was 642.55 ± 11.51 min, which was not statistically significant (P > 0.05) [Table 2]. During the study, four cases of block failure in Group I (PV) and three cases of block failure in Group II (PN) were observed. In Group I (PV) (18.9%), vascular puncture was noticed in 10 patients. Eight patients had vascular puncture one time, and two patients had vascular puncture two times in block failure. There was no vascular puncture in Group II (PN). There was no incidence of local anesthetic toxicity in both the groups [Table 2]. With the development of ultrasound technology, there is an increase in the success rate, shorter onset time, and decrease in the volume required for successful ABPB. The success of brachial block depends on correctly identifying nerves and administering an adequate amount of local anesthetic around them, so that entire nerve covered with the drug. In the past findings of the nerve for block procedure, it depends on either paresthesia elicitation or identification of the motor response on nerve stimulation. Both the techniques have a low sensitivity for the detection of needle-to-nerve contact. In clinical practice, the ultrasound guidance offers the best option to identify peripheral nerves and the advantage of optimizing the spread of the local anesthetic solution around the nerves under sonographic vision. While comparing the methods for the ABPB, the success rate has been reported as the most important indicator, showing success rate 95%–100% with ultrasound introduction., Therefore, different indicators are required in comparative studies; the block performance time and the onset time are important indicators apart from success rate. 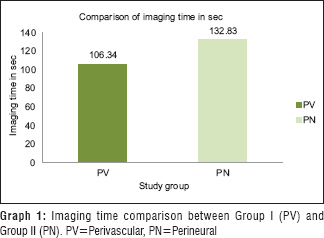 In a study done by Bernucci et al., the mean imaging and needling times for PV group were 0.75 min (45 s) and 7.5 min (450 s) and for PN group were 2.45 min (147 s) and 13.2 min (792 s). The mean performance time in this study was 8.2 min for the PV group and 15.7 min for the PN group. This difference in mean performance time between PV and PN group was similarly noted in our study. Tran et al. showed that the mean imaging and needling time for axillary block were 1 min and 7.35 min. The mean performance time was 8.5 min. Tran et al. showed that the needling time for double injection technique was 1.3 min and imaging time for same was 9.5 min. The mean performance time for double injection technique was 11 min. 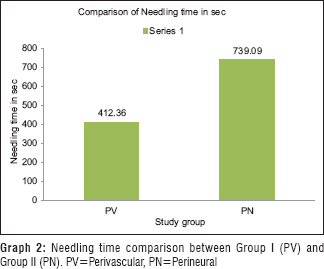 However, we took comparatively more time for imaging and needling for the Group II (PN) compared to Group I (PV), so performance time also prolonged. In the above studies, the blocks were performed by trained persons. In our study, being a tertiary institute, block was performed by residents under the guidance of teachers. Hence, the time delay is attributed to the learning curve. The results of our study were well supported by Bernucci et al., where they quoted the PV technique required fewer needle passes 3.5 (SD, 1.0) compared to 8.2 (SD, 2.2) (P = 0.000) compared to PN technique. In the study by Bernucci et al., the mean onset time for the PV group was 18.9 min and for the PN group was 13.8 min. In other studies by Tran et al., the mean onset time for the PV axillary block was 17.8 min. In another study done by Tran et al. to compare double, triple, quadruple ultrasonography (USG) -guided axillary block, the mean onset time for the axillary block 18.6 min. The difference in this time can be related to the drug used. The various theories favoring the accelerated onset and improved block consistency for the PN group are that the local anesthetics may have been delivered more intimately to nerves by targeting each nerve. The ratio of neural to nonneural tissue is different along the brachial plexus and may influence individual nerve permeability to the local anesthetic. Another possible mechanism is the involvement of threshold number of nodes of Ranvier for the conduction block. More likely, however the surface area of neural tissue was more in perineural group compared to perivascular group. 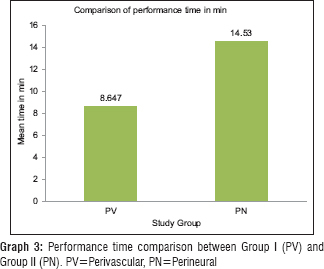 Thus, Group II (PN) had a shorter onset time as compared to Group I (PV) in our study. A highly significant difference was found (P < 0.001). The success of block, defined as the surgery completed without any other form of anesthesia required, was comparable in both groups. Out of 53 cases in each group, four cases in Group I (PV) and three cases in Group II (PN) of block failure were noted. The success rate was 92.5% in Group I (PV) and 94.3% in Group II (PN). Patients supplemented with IV injection fentanyl 1 μg/kg (4 patients), wrist block (1 patient), and general anesthesia (2 patients) in block failure. These patients were excluded from the study. The difference may be due to the fact in PN technique; we inject the drug around each nerve whereas in PV technique, we inject the drug around the axillary artery. In our study, hurried approach done in operation theater due to unavailability of the room to perform the block must have also contributed to the failure. In our study, a vascular puncture is the only complication seen during the procedure. In Group I (PV), 10 patients had a vascular puncture. Then, the needle was redirected and gave the block in the procedure. In Group II (PN), no vascular complication observed in the study. Sites et al. reported that the most common error occurring while giving block with USG guidance is a failure to visualize entire needle length, before advancement. This vascular puncture reflected in this study. Bernucci et al. reported similar result with vascular puncture more in PV group, which they attributed to proximity of needle tip to the artery. During the performance of the block, any incidence of hematoma formed due to vascular puncture treated by application of pressure and performance of the block continued. The duration of motor block and duration of sensory block were comparable between the groups. They were not statistically significant. No incidence of local anesthetic toxicity was noted in both groups. The vital parameters such as heart rate, blood pressure, and oxygen saturation were similar in both groups. Our results in PV and PN technique showed comparable results as similar trials with respect to block success rates, and duration of motor and sensory block. However, we noticed differences in performance time, onset of the block, and number of needle passes and in complications such as vascular puncture. This study includes some limitations. They are lack of experience in performing nerve blocks under ultrasound by residents. During the block procedure, the visualization of a length of the needle and spread of the local anesthetic did not attempt to study. The pediatric age group was not included in the study. There is a future need for more studies and technique to visualize the length of the needle and spread of local anesthetic to prevent vascular and neurological complications during the performance of a block. PV ABPB is better than PN ABPB, in mean imaging time, mean needling time, and mean performance time, but the onset time was shorter in the PN block. The techniques provide direct visualization of the block performance but do not eliminate the risk of intravascular and intraneural injection. With undue precautions, it can be a safe and an effective regional technique in elective and emergency upper limb surgeries. Ethical committee approval was received (06/10/2016, No. 61/2016) for this study from the Institutional Ethical Committee of Shri B M Patil Medical College. Miller RD, Andrew T. Gray-Ultrasound Guidance for Regional Anaesthesia. 7th ed., Ch. 53. Philadelphia: Churchil Living Stone; 2009. p. 1675-702. Miller RD, Horlocker TT, Wedel DJ. Nerve blocks. In: Miller. 7th ed., Ch. 52. Phildelphia: Churchil Livingstone; 2009. p. 1639-72. Abramowitz HB, Cohen C. Use of Doppler for difficult axillary block. Anesthesiology 1981;55:603. Ustuner E, Yılmaz A, Özgencil E, Okten F, Turhan SC. Ultrasound anatomy of the brachial plexus nerves in the neurovascular bundle at the axilla in patients undergoing upper-extremity block anesthesia. Skeletal Radiol 2013;42:707-13. Chan VW, Perlas A, McCartney CJ, Brull R, Xu D, Abbas S, et al. Ultrasound guidance improves success rate of axillary brachial plexus block. Can J Anaesth 2007;54:176-82. Williams SR, Chouinard P, Arcand G, Harris P, Ruel M, Boudreault D, et al. Ultrasound guidance speeds execution and improves the quality of supraclavicular block. Anesth Analg 2003;97:1518-23. Sites BD, Beach ML, Spence BC, Wiley CW, Shiffrin J, Hartman GS, et al. Ultrasound guidance improves the success rate of a perivascular axillary plexus block. Acta Anaesthesiol Scand 2006;50:678-84. Marhofer P, Schrögendorfer K, Wallner T, Koinig H, Mayer N, Kapral S, et al. Ultrasonographic guidance reduces the amount of local anesthetic for 3-in-1 blocks. Reg Anesth Pain Med 1998;23:584-8. Harper GK, Stafford MA, Hill DA. Minimum volume of local anaesthetic required to surround each of the constituent nerves of the axillary brachial plexus, using ultrasound guidance: A pilot study. Br J Anaesth 2010;104:633-6. Tran QH, Clemente A, Doan J, Finlayson RJ. Brachial plexus blocks: A review of approaches and techniques. Can J Anaesth 2007;54:662-74. Imasogie N, Ganapathy S, Singh S, Armstrong K, Armstrong P. A prospective, randomized, double-blind comparison of ultrasound-guided axillary brachial plexus blocks using 2 versus 4 injections. Anesth Analg 2010;110:1222-6. Bernucci F, Gonzalez AP, Finlayson RJ, Tran DQ. A prospective, randomized comparison between perivascular and perineural ultrasound-guided axillary brachial plexus block. Reg Anesth Pain Med 2012;37:473-7. Ambi U, Bhanupriya P, Hulkund SY, Prakashappa DS. Comparison between perivascular and perineural ultrasound-guided axillary brachial plexus block using levobupivacaine: A prospective, randomised clinical study. Indian J Anaesth 2015;59:658-63. Pfeiffer K, Weiss O, Krodel U, Hurtienne N, Kloss J, Heuser D, et al. Ultrasound-guided perivascular axillary brachial plexus block. A simple, effective and efficient procedure. Anaesthesist 2008;57:670-6. Tran DQ, Pham K, Dugani S, Finlayson RJ. A prospective, randomized comparison between double-, triple-, and quadruple-injection ultrasound-guided axillary brachial plexus block. Reg Anesth Pain Med 2012;37:248-53. Cho S, Kim YJ, Kim JH, Baik HJ. Double-injection perivascular ultrasound-guided axillary brachial plexus block according to needle positioning: 12 versus 6 o'clock position of the axillary artery. Korean J Anesthesiol 2014;66:112-9. Kumar A, Sharma D, Sibi ME, Datta B, Gogoi B. Comparison of peripheral nerve stimulator versus ultrasonography guided axillary block using multiple injection technique. Indian J Anaesth 2014;58:700-4. Perlas A, Niazi A, McCartney C, Chan V, Xu D, Abbas S, et al. The sensitivity of motor response to nerve stimulation and paresthesia for nerve localization as evaluated by ultrasound. Reg Anesth Pain Med 2006;31:445-50. Soeding PE, Sha S, Royse CE, Marks P, Hoy G, Royse AG, et al. A randomized trial of ultrasound-guided brachial plexus anaesthesia in upper limb surgery. Anaesth Intensive Care 2005;33:719-25. Hussien RM, Ibrahim DA. Ultrasound guided axillary brachial plexus block versus supraclavicular block in emergency crushed hand patients: A comparative study. Open Anesth J 2018;12:34-41. Minville V, Amathieu R, Luc N, Gris C, Fourcade O, Samii K, et al. Infraclavicular brachial plexus block versus humeral approach: Comparison of anesthetic time and efficacy. Anesth Analg 2005;101:1198-201. Tran DQ, Muñoz L, Zaouter C, Russo G, Finlayson RJ. A prospective, randomized comparison between single-and double-injection, ultrasound-guided supraclavicular brachial plexus block. Regional Anesth Pain Med 2009;34:420-4. Sites BD, Spence BC, Gallagher JD, Wiley CW, Bertrand ML, Blike GT, et al. Characterizing novice behavior associated with learning ultrasound-guided peripheral regional anesthesia. Reg Anesth Pain Med 2007;32:107-15.